You can choose from several options for earning interest on your account value: one fixed interest option (with a guaranteed rate) and additional options tied to market indexes. You will enjoy tax benefits such as tax-deferred growth potential on your account, insurance benefits which are, generally speaking, not subject to income tax, and some tax-advantaged access to your surrender value. You may withdraw money at any time after year one. These withdrawals may be subject to surrender charges. The "S&P 500 Index" is a product of S&P Dow Jones Indices LLC, a division of S&P Global, or its affiliates (“SPDJI”) and has been licensed for use by Fidelity & Guaranty Life Insurance Company. Standard & Poor’s® and S&P® are registered trademarks of Standard & Poor’s Financial Services LLC, a division of S&P Global (“S&P”); Dow Jones® is a registered trademark of Dow Jones Trademark Holdings LLC (“Dow Jones”); These trademarks have been licensed for use by SPDJI and sublicensed for certain purposes by Fidelity & Guaranty Life Insurance Company. These Life Insurance products are not sponsored, endorsed, sold or promoted by SPDJI, Dow Jones, S&P, their respective affiliates, and none of such parties make any representation regarding the advisability of investing in such product(s) nor do they have any liability for any errors, omissions, or interruptions of the S&P 500 Index. Barclays Bank PLC and its affiliates (“Barclays”) is not the issuer or producer of Fixed Indexed Universal Life Insurance and Barclays has no responsibilities, obligations or duties to contract owners of Fixed Indexed Universal Life Insurance. The Index is a trademark owned by Barclays Bank PLC and licensed for use by Fidelity & Guaranty Life Insurance Company as the Issuer of Fixed Indexed Universal Life Insurance. Additionally, Fidelity & Guaranty Life Insurance Company as Issuer of Fixed Indexed Universal Life Insurance may for itself execute transaction(s) with Barclays in or relating to the Index in connection with Fixed Indexed Universal Life Insurance. Contract owners acquire Fixed Indexed Universal Life Insurance from Fidelity & Guaranty Life Insurance Company and contract owners neither acquire any interest in Index nor enter into any relationship of any kind whatsoever with Barclays upon making an investment in Fixed Indexed Universal Life Insurance. Fixed Indexed Universal Life Insurance is not sponsored, endorsed, sold or promoted by Barclays and Barclays makes no representation regarding the advisability of Fixed Indexed Universal Life Insurance or use of the Index or any data included therein. Barclays shall not be liable in any way to the Issuer, contract owners or to other third parties in respect of the use or accuracy of the Index or any data included therein. Even though contract values may be affected by external indexes, the life insurance contract is not an investment in the stock market and does not participate in any stock, bond, or equity investments. Indexed growth rates are subject to caps, participation rates and/or spreads, which may change at the discretion of Fidelity & Guaranty Life Insurance Company. 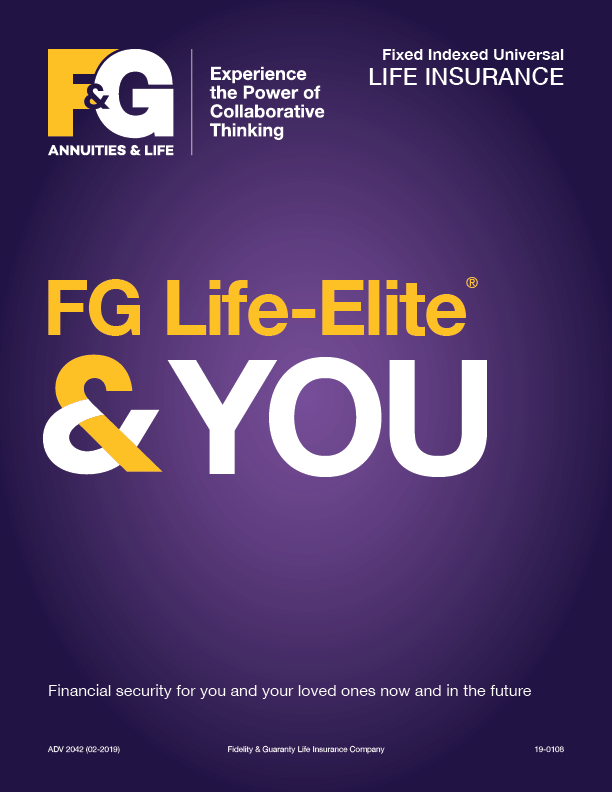 Download our product brochures to learn more about FG Life-Elite.